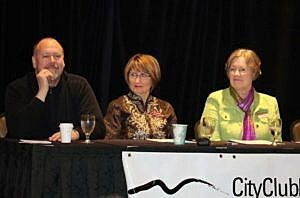 From left to right, Missoula Mayor John Engen, University of Montana President Sheila Stearns and Missoula County Commissioner Jean Curtiss answer questions from the audience during Monday’s State of the Community presentation. Community leaders on Monday said collaboration and smart budgeting will serve as the pathway forward as Missoula’s three governing bodies plan for the future, one where housing and providing basic needs with limited resources will linger as pressing challenges. Hosted by the City Club Missoula, the annual “State of the Community” saw Missoula Mayor John Engen, Missoula County Commissioner Jean Curtiss and University of Montana President Sheila Stearns touch on their organizations’ successes, and outline their goals for the coming year. Engen painted a picture of the city’s pressing initiatives through the lens of intentional steps. In the past, they have included overcoming issues surrounding sexual assault, purchasing open space to protect the city’s view sheds, and taking steps to own Missoula’s drinking water system. As the city looks forward, Engen said it must continue to welcome refugees, keep Mountain Line’s zero fare service in place, and reduce the cost of college education, possibly making tuition free at Missoula College. Missoula must also get intentional about ending hunger and providing housing for all. On the housing front, the city last year created its new Office of Housing and Community Development. With Eran Pehan at the helm, the office is looking for unique ways to provide affordable housing, and to house the homeless. Engen said the city will write policies once the data comes in. As the University of Montana gears up for its 125th anniversary next year, the campus community will confront what President Stearns described as a series of strategic decisions. While the state of the university is strong, Stearns said, the school will work to improve student recruitment, prioritize its program offerings, and reduce its personnel budget to reflect financial reality. Stearns, who took the presidential post on an interim basis last year, will be replaced by a new university leader over the coming year. Her goal is to leave her predecessor with a renewed organization and a solid, stable budget. Getting there will begin with a number of initiatives, she said. Stearns said the university has the pieces in place to tackle the challenges and come out ahead, though getting there will require campus collaboration and difficult but necessary decisions. She said the school has and will continue to pursue new enrollment initiatives to stabilize its incoming class and grow future classes. The university can grow its student population back to record highs, she added. As she did during her state of the university address, Stearns said UM will also pare down the percent of its budget devoted to personnel. That will include selective hiring, creative retirement incentives and streamlined services. Commissioner Curtiss said Missoula County must also make strategic financial decisions as it looks at a number of costly services, from replacing elections equipment to maintaining several hundred miles of roads. Public safety also remains a county priority. In 2016, the county’s Crime Victim Advocates helped nearly 2,000 victims of crime by offering support, safety and hope, Curtiss said. It also trained 800 elections judges and will soon be faced with replacing its aging voting equipment. The county also maintains 400 miles of roadway, a fact that taxes the county’s budget.